The reigning World Champions hit four goals again in their victory over Iceland to make it two wins from two and return to the top of Group H.
France invited Iceland to the city of love on Monday evening but there was no room for sentiment as Didier Deschamps men treated their visitors to a ruthless display, endearing themselves to an already infatuated French public and brushing aside their opponents in the process at the Stade de France. The hosts didn't exactly need a confidence boost ahead of this fixture given their recent success but their dominating 4-1 victory in Moldova on Thursday was the ideal warm-up. With Turkey topping the group by virtue of their victory over the same opponents in Eskisehir, they couldn't afford any slip-ups in game number two if they fancied a quick return to the top of the table. After a reality check in the UEFA Nations League, Iceland successfully negotiated their trip to Andorra in their opening group match before making the trip north looking to cause an upset as they returned to the scene of their EURO 2016 exit to the same opponents three years ago. It was a party atmosphere in Saint-Denis ahead of kick-off with the celebration of the 100th anniversary of the French Football Federation. The players wore special shirts to commemorate the occasion and delivered a special performance on the night too. For all their success and star players, France are not a side that often control the football, winning the possession battle in just two of their last seven matches while their World Cup success came with just 34% of the ball in the final. Any fears of similar statistics on this night soon disappeared with Iceland having a clear game plan and allowing their opponents free rein of the ball. 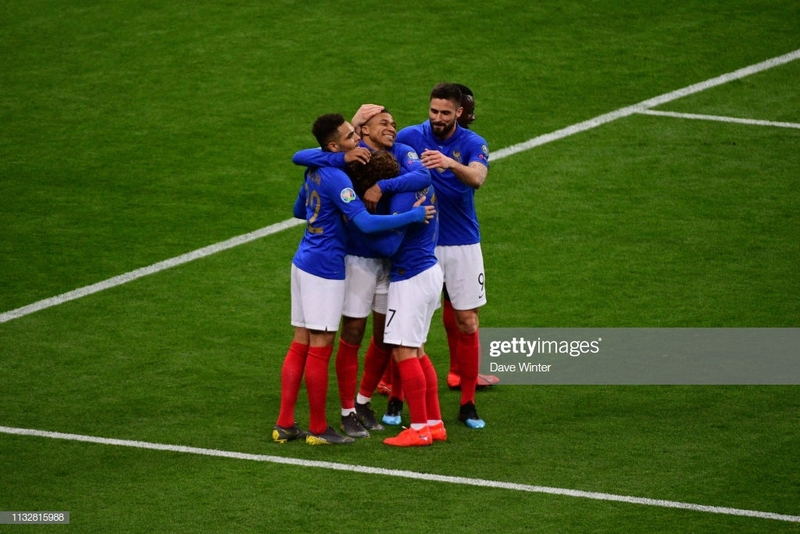 France are a strange enigma, one moment they are slow, almost robotic in their play as they wait for their moment then suddenly burst into life and after eleven minutes of the match, that is exactly what happened. Kylian Mbappe, the superstar and new face of French football, received the ball on the left, delivering an inch-perfect cross for Samuel Umtiti to guide onto the post and into the net. Iceland struggled to gain any hold of the ball but on the rare occasions that they did, they offered their healthy travelling support some hope. Ragnar Sigurdsson with the first chance of the night, a header that was all too easy for Hugo Lloris and a "what might've been" moment for the FC Rostov defender. Benjamin Pavard was one of the breakout stars in the summer and the Bayern Munich-bound full-back showed more glimpses of his ability, a wonderful cross onto the head of Olivier Giroud, his effort forcing Hannes Halldorsson into an excellent save to tip the ball over the crossbar. Gylfi Sigurdsson was next to pass up a decent opportunity for his side. With set-pieces looking increasingly like the only route to goal, a high ball from the free-kick was headed as far as the edge of the area for the volley which skipped off of the turf and into the hands of the goalkeeper. Every time Mbappe touched the ball, the anticipation rose inside the stadium and the PSG player had two moments in quick succession. The first coming after a frightening display of pace that saw a shot zip just wide of the post before nice link-up play with Antoine Griezmann and Giroud allowed another chance that was ultimately disappointing from the 20-year-old. The start of the second half brought around Iceland's best chance of the night. Aston Villa's Birkir Bjarnason stinging the palms of Lloris from outside the area. Impressively, Bjarnason had found the net in the previous three fixtures against France but not this time as he was denied by the Tottenham Hotspur keeper. As the hour approached, Pavard opted for the spectacular again. He had downed Argentina at the World Cup with a similar sort of strike and after meeting the ball outside the box from a corner, his volley fizzed agonizingly wide of the left-hand post. France continued to stroke the ball around nicely and create half-chances on goal but the second goal really pushed them into gear. Pavard became the architect with a ball into the box, flapped at by Halldorssan, that landed at the feet of Giroud for an easy tap-in. Goal number thirty-five for the Chelsea striker that moves him ahead of David Trezeguet and into third in the all-time scorers list for his country. Next, Mbappe would get the goal his performance deserved. Paul Pogba finding Griezmann, the Europa League winner playing through the forward with a crisp pass and the golden boy did the rest under pressure to poke the ball beyond the goalkeeper and seal the victory and three points. Gylfi Sigurdsson should've clawed back a consolation in the final ten minutes but it was Mbappe and Griezmann with the final say. Mbappe's backheel assist weighted perfectly to return the early favour as Griezmann finished expertly into the net to add a gloss to the performance. France didn't really need to exert themselves but this was another cool, composed display by a staggeringly good outfit. There is something about this French team. They make it look so effortless and while Iceland are not the most difficult side France have faced in the last few months, they were brushed aside with such ease and professionalism. They have it all. One genuine superstar, an abundance of pace and technical ability. They have big, strong, imposing players and diminutive, fast, skilful players too. Not to mention the exceptional strength in depth throughout the squad. Several players that would walk into any other major national side in the world have to make do with a spot on the bench due to the deep talent pool in this generation. The best play from the team came down both wings all evening with Pavard and Mbappe linking up brilliantly on the right. All the threat came down the wings with Griezmann, Pogba and others not afraid to venture out there to create more chances and for most of the night, Iceland couldn't cope. With this squad at their disposal, even with the qualification stage only just beginning, many make France the favourites to lift the European Championship trophy in 2020. Kylian Mbappe has the world at his feet. He has not looked back since bursting onto the scene at Monaco in 2016 and he has quickly become one of the best players in the world and a genuine idol to French football fans everywhere. Every time he touched the ball on Monday, the crowd volume rose inside the Stade de France. His trickery and pace but also more crucially his assists and goal on the night were all magical. He has a rocket strapped to his back and the hopes of a nation will continue to rest on his shoulders as he races to the very top in world football. This match marked his thirtieth appearance on the international stage and his twelfth goal. These incredible statistics will only continue to grow as he surpasses the feats of Lionel Messi and Cristiano Ronaldo at the same stage for their national sides. This boy is special and the French certainly know it. Not much more has to be said on Mbappe. He was the livewire in the team and had Iceland terrified every time he touched the ball. His assist to Griezmann was good but the finish for his goal was even better, brushing off defenders to beat the goalkeeper. His beaming, infectious smile is quickly becoming a common sight such is the regularity of his goals for club and country. Olivier Giroud still has his detractors at international level and sometimes at his club too, but he was there once again to find the goal. His header for the second denied Iceland any chance of a comeback and helped reach that aforementioned milestone. He is increasingly important to Les Bleus and showed exactly why once again. Benjamin Pavard was keen to impress, his two fizzing volleys came close and he looked threatening. His assist for Giroud's goal was evidence of the sort of impact he can make. Meanwhile, Layvin Kurzawa, on the other side, worked hard and impressed without producing any end product. As for Iceland, no one really performed on a difficult night. Gylfi Sigurdsson had a couple of chances and should have scored a tap-in at the end. Bjarnason was the only player to genuinely test Lloris as Iceland failed to score for the first time in five matches against the French. Iceland came to Paris looking to avenge the defeat inflicted on them in the EURO 2016 quarter-final but it was France's very own Avengers that brushed them aside. These blue-shirted superheroes can currently do no wrong and from the perspective of those inside the stadium and across France, the good guys won... again.